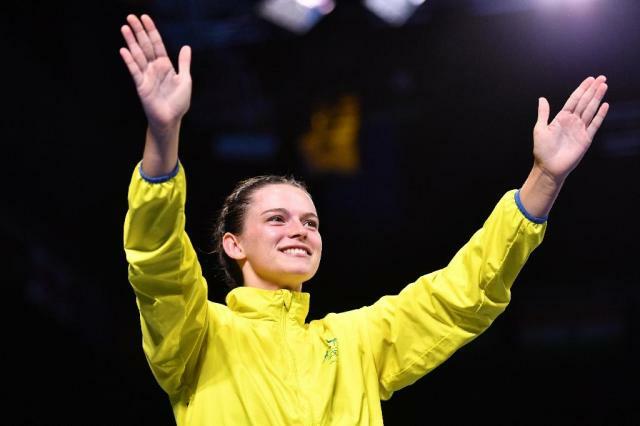 Gold Coast (Australia) (AFP) - Australia's Skye Nicolson dedicated her victory to the tragic late brother she never met as England topped the final medals table in Commonwealth Games boxing on Saturday. In front of her watching parents and a willing home crowd on Australia's Gold Coast, the 22-year-old Nicolson benefited from a debatable split-points decision in her featherweight final against the unfortunate Michaela Walsh of Northern Ireland. Boxing is in the blood of her family but Nicolson never met either of her brothers Jamie and Gavin after they were killed in a car crash in 1994 while on their way to training. Nicolson was born a year later and feels particularly close to Jamie, who was an Olympic and then professional fighter with a big future before his life was cut short. Her parents say that she looks and boxes like Jamie, who won Commonwealth bronze in 1990. "I had a little chat with them (the deceased brothers) before I went in (the ring) and they were definitely in there with me," Nicolson, the face of Australian boxing at these Games, said. "I won that medal for both of us and I'm so stoked," she added, referring to Jamie, who was the same age Nicolson is now when he died. He also fought at the same weight and, like his sister, was an awkward southpaws. Jeff Horn, Australia's WBO welterweight world champion, was in the crowd to see the hosts seal three golds at Oxenford Studios, where Hollywood blockbusters including the latest in the "Pirates of the Caribbean" movie series were shot. Australia's medal tally included bronze for Taylah Robertson, even though she lost her only bout, having been given a bye into the semi-finals of the seven-woman flyweight class. The beaten Walsh, who had appeared to have the better of the bout with Nicolson, begrudgingly accepted silver, covering her face at one point during the medal ceremony, tears in her eyes and her face red and puffy. It was a nearly day for the Walsh family: brother Aidan also finished with silver after losing to the classy Pat McCormack of England in the welterweight class. "I really thought she won the fight but we have to accept the result and move on," said Aidan Walsh. England came into the Games with high expectations and they took home a leading six golds, followed by Australia and India with three each. England's light-flyweight Galal Yafai, whose brother Khalid is a world champion at super-flyweight, said he had trumped Khalid and his other professional boxing brother, Gamal, in winning a Commonwealth title. Super heavyweight Frazer Clarke claimed number six for England as he won the last bout against Satish Kumar of India in a bruising encounter. But India have also enjoyed a successful Games in the ring, with women's great Mary Kom finally winning gold to add to her trophy cabinet of five amateur world championship crowns and Olympic bronze. It was one of three boxing titles for India, whose Games started inauspiciously when they were reprimanded for breaching the 'no needle policy' for injecting a sick fighter -- who has not been named -- with vitamins.